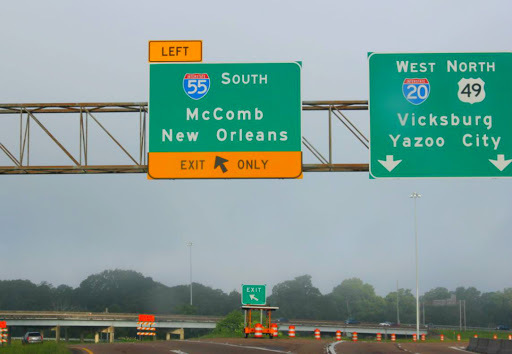 **I have never visited the south (as an adult), and I’ll be the first to admit that I had a lot of preconceived notions about what it would be like that turned out to be completely wrong! For instance, I assumed everyone spoke with a thick southern accent, which was not the case at all, likely because of the tourist-oriented area we visited. I had also assumed that the south was dry and didn’t have much in the way of plant life, but not only did we see tons of foliage, including tropical plants and palm trees, there were also lots of plants that are commonly found in Michigan such as bracken ferns and pine trees, which was very surprising to me. While I may have had some silly expectations, I believe traveling and seeing the world as it truly is, not just as we think it is, is one of the best ways to grow as a person! After our departure from the state park in Jackson, MS, we had a three hour drive ahead of us before we reached New Orleans. While en route, we saw SO many armadillos! They were mostly “sleeping” on the side of the road (think of the frequency of which one finds raccoons and opossums on the side of the road in Michigan). Luckily, we found a few that were still scooting around, healthy as can be, and they were so much fun to watch! We drove without stopping and reached our destination around 10:30 am, with plenty of time to see the city! 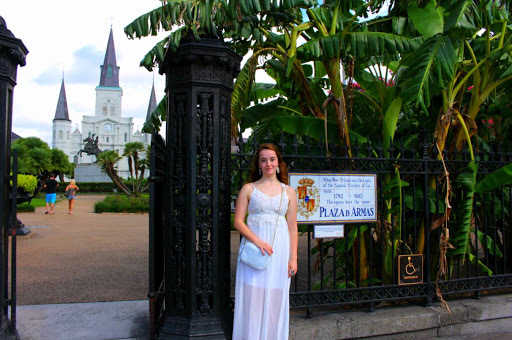 We had reservations at Hotel Monteleone, so we headed there first, thinking we may be able to check in early. Unfortunately, our room wasn’t ready until nearly 2:30. This was tremendously disappointing because a. we were hot and sweaty and hadn’t showered in nearly 2 days after doing almost nothing but sitting in a car and camping & b. we needed to sleep a bit more! However, we made it work and explored the city in the mean time, site seeing, watching street performers, and taking a few photos of the incredible city. Hotel Monteleone as approached from the west. The lobby of the Hotel was SO gorgeous (and cool). It was the perfect place to escape the 100 degree heat and high humidity! Having left our bags with the bellhop of the hotel, we were able to walk about unencumbered. We saw lots of interesting architecture, costumed people, and massive youth groups. We happened to be there the same weekend as some sort of National Christian Youth convention, which struck me as very odd because NOLA doesn’t necessarily come to mind when I think of “Christian friendly” destination, not that there’s anything wrong with the city, but still lol. Later that evening it became very clear to me why they were there, but more on that later. These gas powered lamps were all over the city burning day and night. 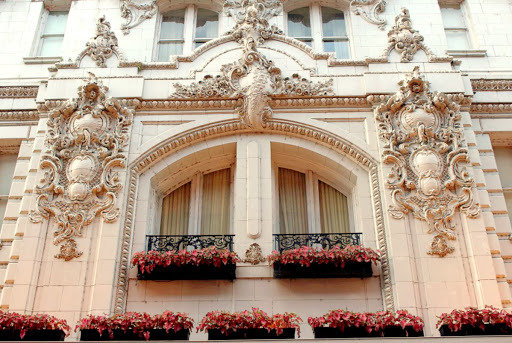 They were very beautiful and added an elegant touch to the fronts of buildings. 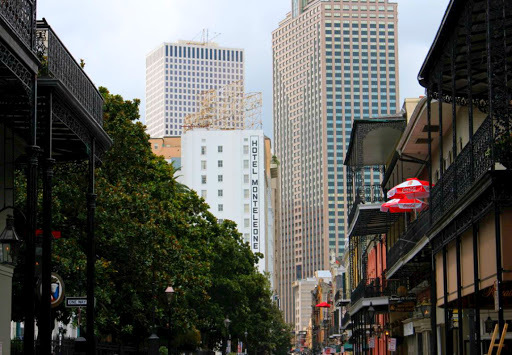 Louisiana was originally the capital of the French occupied territories in north America, and it was incredible to see the legacy they left behind in the architecture around the city. I’ll admit, I assumed people in the deep south would have southern accents, but I never once heard anyone speak in a way that was different from those who live in Michigan. There was a bit of slang spoken that we were able to pick up on pretty quickly (I didn’t know what delicious magical-ness a beignet was until visiting NOLA), but aside from that and the occasional French word tossed in by the hotel staff, what I’d expected was again not how the city was. I’m sure if we had ventured outside of the touristy areas of the cities we would have found people with more varied accents, but time did not permit us to visit anywhere truly off the beaten path. There were many little alcoves tucked away throughout the city, protected from the outside by gates. This photo, and the one below, were taken from behind a wrought iron gate. For a city that lives in such constant heat, they had a ton of beautiful ferns and plants commonly found in the north. I wonder, are they difficult to maintain? We came across these really cool street performers, and received permission from someone who was evidently their manager/body guard to film them. You can see the video here! Around 2:30pm we were able to check in to our room and FINALLY take a shower and take a nap. I don’t think bathing had ever felt so wonderful! The entire trip in the car was comfortable (we had air conditioning and very comfortable seats), however camping and sleeping in a car was not ideal. I didn’t take nearly as many photos of myself as I’d planned in the cute outfits I wore because not only was my hair incredibly frizzy due to the high humidity, but I didn’t feel very confident covered in sweat. We awoke from our brief nap and felt much better, although I had my doubts about my husband’s energy level, since he had spent the last two days driving nearly non-stop. We took a dip in the hotel pool and showered off to energize ourselves and prepared for an evening out. 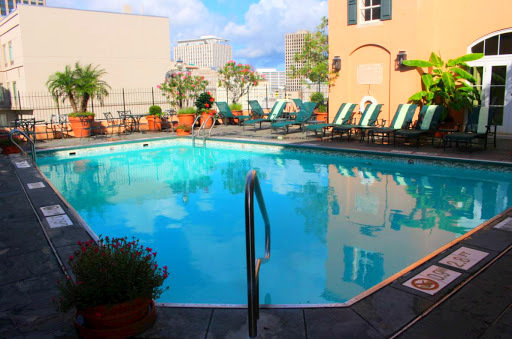 Hotel Monteleone Rooftop Pool tour! Since we hadn’t yet eaten, and by now it was almost 4pm, we headed to a restaurant nearby called Napoleon House which had delicious food. We ordered a Garden Sandwich (Red leaf lettuce, tomato, avocado, sprouts, cream cheese, balsamic Dijon vinaigrette on walnut-raisin bread) and a Corsican Salad (Red leaf lettuce, Kalamata olives, Roma tomatoes, toasted walnuts, red onion, gorgonzola cheese and balsamic-raspberry vinaigrette) and enjoyed it very much! I was shocked (and slightly saddened) to see that they offered alligator sausage and a few other questionable items, but I was too hungry to think much about it. Maybe this was why I didn’t get to see my gator in Mississippi, they were being eaten before I could find them! 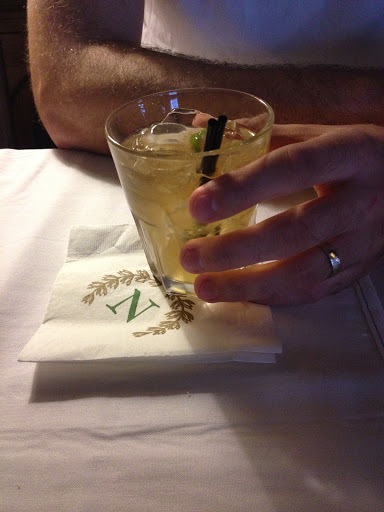 We also enjoyed a classic drink, the Dark ‘N Stormy, which was the best I’d ever tasted! We did stop briefly before lunch to take a picture of what we were wearing. I elected to don my Lilly Pulitzer chomp chomp shorts in order to increase my odds of seeing a gator (that’s how it works, right? ), but it wasn’t meant to be. My top is from Chic Wish, my wedding rings are from Brilliant Earth, and the statement ring can be found here! Robin, rocking his Lilly Pulitzer Get Nauti shorts, a Calvin Klein Polo, Sunglasses from Urban and shoes from Lacoste. We wandered around town some more, visited a few shops, sat by the Mississippi river watching ships cruise by and had a wonderful conversation with a NOLA cop handing out free t-shirts. The relationship the people seemed to have with the police in this city was vastly different from anywhere else I’d seen. The cops gave directions, bought drinks, walked amongst the people, and were constantly smiling. At one point we even saw a few cops break dancing with some people wearing “black lives matter” tees, which by the way they were all very talented dances haha. At first I didn’t think they were real police officers, but evidently they want to be seen as trust worthy, which was so nice to see compared to all of the horrible things we hear about police on the news. Sadly, while we were there, several police officers were shot and killed in Baton Rouge, which was what most people talked about in town during our trip. The Plaza de Armas park! Oddly enough, this seafood restaurant had more vegetarian options than any other restaurant we could find! 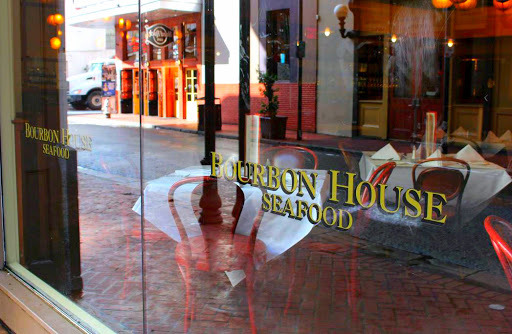 We decided to eat dinner around 8:00pm at the Bourbon House Seafood Restaurant, which surprisingly had more vegetarian options than any other place we could find. The wait was a bit long, but it was well worth it. Out of all of the places we ate on our adventure, this was by far my favorite. We shared a Cesar salad and the tuna poke nachos (Gulf tuna, pecans, avocado, cucumber, tropical fruit coulis, wonton chips, red onions, wasabi aïoli, toasted nori) which were out of this world! I don’t typically eat fish, but this was incredible, and I am so glad I gave it a shot! (Sorry mighty tuna, your sacrifice is greatly appreciated!). If you’re ever in town, I highly recommend this place! 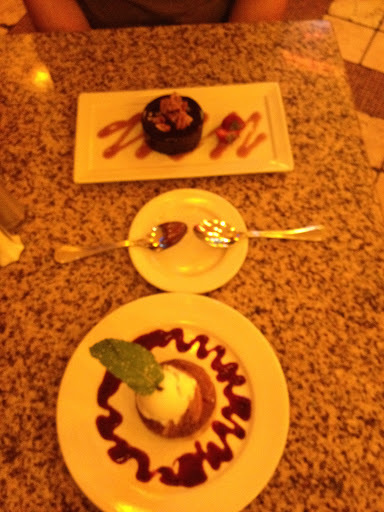 For desert, we decided to go big and ordered two desserts (I know, living life on the edge, we’re crazy young people, wow, outrageous! [hehe]), the Chocolate Pecan Crunch (dark chocolate mousse, pecans, salted caramel, dark cocoa glaze) & the New Road’s Pecan Pie (Steen’s cane syrup and molasses, caramel, home made praline, vanilla bean ice cream), both of this were incredible! Closest to Robin: Chocolate Pecan Crunch (AMAZING). Sorry for the poor quality photos, the lighting was super yellow! See the two people in the red outfits? They were getting married. In the middle of the street. At 11:00pm in NOLA. Surrounded by spilled booze & empty cups. Congratulations to the happy couple! After dinner, we decided to take a walk downtown to see what all the fuss was about. 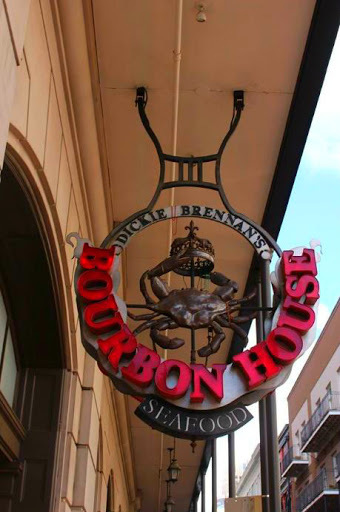 Everyone had said that was the best part of New Orleans, so we decide to check it out for ourselves. Neither of us are big drinkers, so we elected for some cold tea and iced coffee to sip on while we walked around. Most people had one (or more) drinks in their hands walking around in the streets (which they cordoned off to allow for pedestrian traffic, nightly!) so we didn’t look out of place. We counted 15 bachelorette parties, lots of “nip slips” (evidently people really do flash people on the balconies to get the cheap beads they sold in packs of 10/$3 at gift shops), and many other strange things. I thought the “flashing for beads” thing was a joke, but it’s real haha. I mean, I don’t get why they don’t just go buy the beads directly from the gift shops since they’re so cheap (and were still open). I wouldn’t do something like that, unless they were tossing out $100,000 Lilly Pulitzer gift cards and industrial monogram machines, and even then I’m pretty sure I wouldn’t haha. My sweet husband seemed oblivious to the people on the streets and instead was absolutely fascinated with the architecture surrounding us and the strange shops that were still open. Into many such shops we went, peaked around, and exited quickly, like many others. There were some incredible musicians playing in the open air bars and cafes, and lots of dancers were attempting to lure us in to open air clubs to dance. What struck me the most was not the odd behavior of my fellow tourists, but rather the people standing in the middle of the streets. Remember the youth groups I’d mentioned earlier? We’d found them again! Although this time instead of pushing us in line at Urban Outfitters, they were holding megaphones, standing on literal soap boxes (more on that later), yelling at us “heathens” to repent, convert to Christianity and save our souls from the depravity surrounding us. At one point, someone got in my face yelling at me that God hates what I’m doing and I need to “turn my back on sin and embrace the lord”. Now, I’m a God fearing person too, but I don’t really think drinking tea (without sugar no less! haha), holding hands with my husband walking downtown exploring a new city is wrong. Some people stopped to listen to them, but most people ignored the fanatics and continued drinking, singing, and dancing the night away. When more people were stumbling than walking (and after I’d seen a Bride-to-Be confuse the wall of a bar for a bathroom!? ), we decided we’d seen enough and headed back to our hotel. 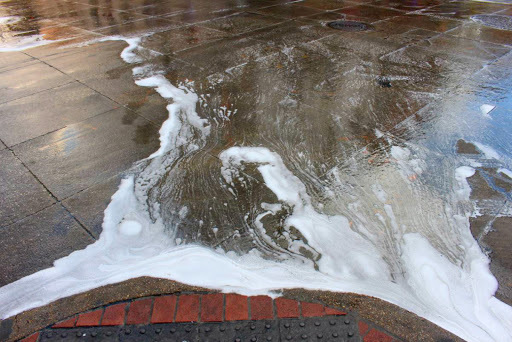 Unfortunately the smell in New Orleans only gets worse the later the day goes on. I have a pretty strong sense of smell, and I was a few hours deep into a scent induced migraine which may be part of why I didn’t enjoy the city as much as everyone else seemed to be. 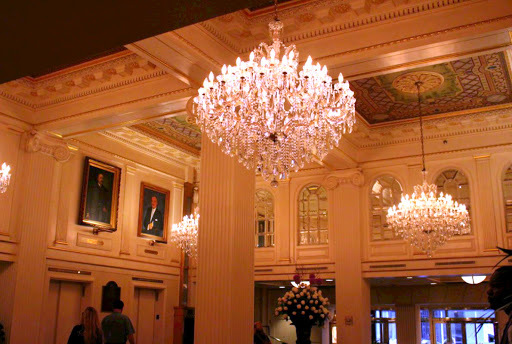 Only mildly scarred for life, the cool air of Hotel Monteleone’s lobby was incredibly inviting. I forgot to snap a shot of the carousel bar (it actually turns, and it’s so beautiful! 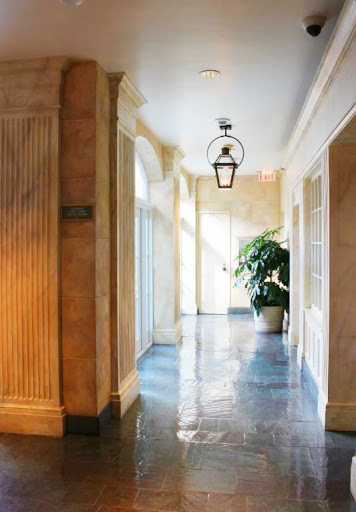 ), but it seemed like a cool place to grab a drink and was located right inside the entry of the hotel. We got back to our hotel, showered yet again, and called it a night. 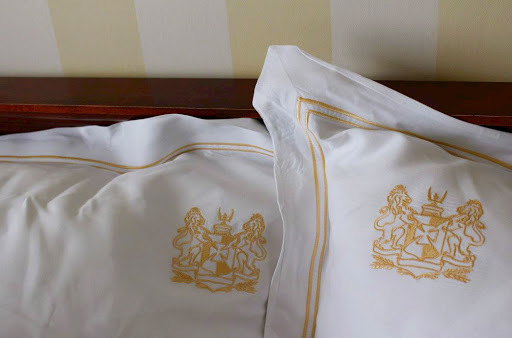 Hotel Monteleone’s embroidered pillows are so #goals! Around 8am we woke up (normally we get up around 5:30 or 6, but we were exhausted) and packed up our things, preparing for the 16.5 hour drive back to Michigan that day. 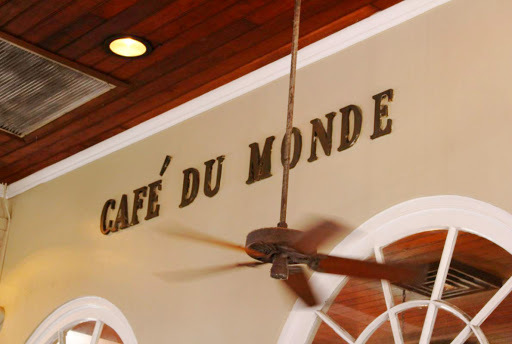 Prior to leaving, we headed up to the pool for another dip, we showered again, and embarked on our journey to try the elusive beignets from Cafe du Monde. The line was out the door and around the corner of the building, but it moved much faster than the line at the auto rental place. We had the pool all to ourselves early in the morning! Everyone must have been tuckered out partying so hard all night long! The area leading up to the rooftop pool & fitness center. I could’ve stayed here all day! The entire cafe was takeout style. More fans in the open air cafe. We split an order of beignets (which are fried dough covered in powdered sugar) and iced coffees. We stopped on the way out of town for some fruit because we hadn’t been eating very healthy things during our trip! We picked up our car from the valet. The auto garage – hotel nexus. The rest of our trip was pretty uneventful. We arrived back home around 3am and Robin went to work the next day, as though nothing had happened! I admire his endurance haha. We passed through 14 states, met tons of super friendly people, saw gorgeous sites and ate delicious food. While it was much hotter and muggier than we’d expected, the city of New Orleans smelled pretty bad, and we spent a majority of our time in the car (singing Disney songs, playing the license plate game [we were only missing Alaska, Hawaii, and Rhode Island], it was so fun and I am incredibly thankful that I got to spend that time with my husband! I wish we could have gone off the beaten path and seen more “authentic” Louisiana living, and I wish we could’ve made more stops along the way to explore places like the St. Louis Arch and the city of Nashville, but all in all it was an incredible trip that I will remember for the rest of my life! What is the longest road trip you’ve ever taken? 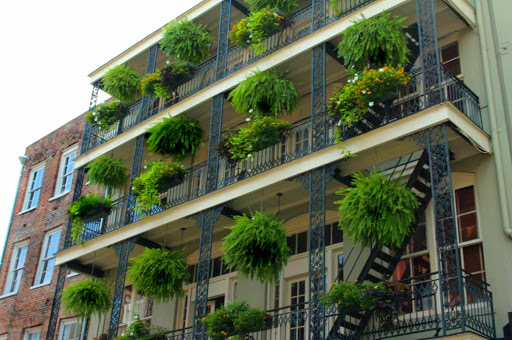 What are your favorite things to do in New Orleans? Did we miss any must see things?